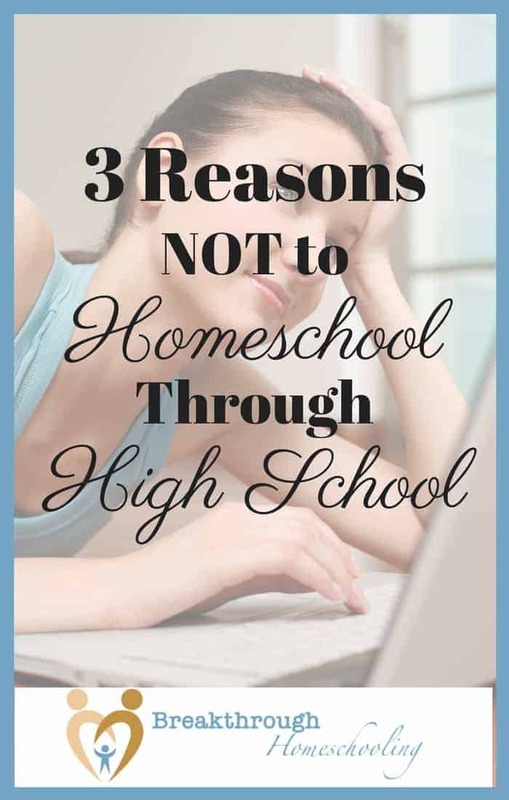 To Keep Homeschooling thru High School or Not? Now that is the Question! When we first started home educating, I remember thinking that we might do this until 8th grade, but certainly not beyond! After all, what about teaching science: chemistry, biology, physics, and their respective labs? And high school math? Never! Then there are electives and the extracurricular activities! And how will they ever get into college? I still shudder to remember my fears. You may be experiencing some of those right now. However, having been through it three times already, I now eagerly anticipate it for our two younger ones. Our 2 oldest children were as different as they come. Our son was gifted athletically, and a real kinesthetic student. He is so talented at figuring things out: building, puzzles, and creative computer applications. Our daughter was the “typical” scholar: enjoying and excelling in academics. Understandably, we tailored their high school years as uniquely as their learning styles. 1) It is more time consuming for the parent than the lower grades. Although a good student can pretty much work self-paced, it does take some time on the parent’s part to research curricula on the front end, and then handle problems with the lessons and grading, on the back end. One tip: start your search early (when your child is in 7th or 8th grade) and look for curricula that offer on-line help. If you’re in the least bit unsure of yourself…stay away from anything that doesn’t have pre-written test or answer keys!! This is a time when your child will be beginning to explore either college or career options for herself. College-bound students will benefit not only from help choosing career options but will need assistance with choosing a college. If your child does not seem destined for “advanced academia”, you may want to help her seek out part-time or summer jobs in a field where they show interest or ability. Or consider a gap year under a mentor or someone skilled in a field they’re curious about or interested in to gain experience and develop interests and vision – that can reap huge rewards! There are also non-academic concepts that you may want to review to prepare your teen, as presented in these TED talks. 3) High school curricula will often cost more. If you’ve been homeschooling a while, by the time you get to this stage you may realize that there are ways to get around this, but keep in mind that, even if you find more economical resources, teaching these subjects may require more time on your part. So basically your decision is: which do I have more of ~ time or money? As the concept of home education moves beyond its early years, more and more resources have become available and are being developed. Today it is certainly easier than ever to continue educating your child at home through his challenging and crucial teen years. Finally, if you need a final encouraging “nudge”, check out this Letter from a Homeschool Graduate to get a peek into what IS possible! Need help getting started? You may want to consider my courses for new and beginning homeschoolers: “Everything you need to lay the groundwork for a quality home education experience!” Subscribe to this site today and get information on that course, as well as other courses, homeschool updates, information, and inspiration.